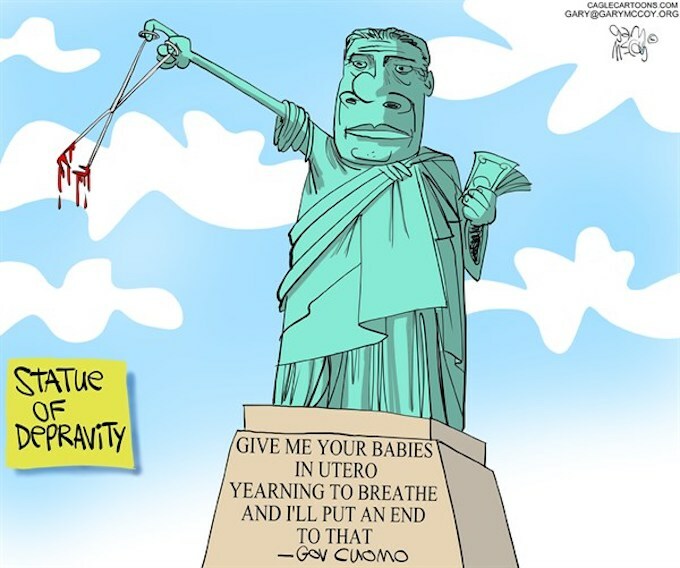 Personally, I would be all for the late term (up to the 240th trimester) abortion of most democrat politicians in the country–especially in New York. I’d even go so far as to extend it to all democrat voters. New York is like California you hope it will fall off into the sea with no survivors. Which is why i LOVE watching disaster flicks, to see NY and CA get decimated..
People wonder why the Founders included The Electoral College in the Constitution? Wouldn’t the Nazi’s be very, very proud? How long before the Dem Hitlers start constructing concentration camps and crematoria to deal with America’s Jews, Christians and any others who don’t meet the standards of America’s Nazis. Well done Dem politicians and the MSM as you have joined the ranks of Hitler, Stalin, Pol Pot, Castro, et al. May you all rot in Hell. Full term baby body parts sell for a LOT MORE than early-term baby body parts. THAT is the reason this MONSTROUS EVIL is being perpetrated, and the ONLY REASON–to placate the powerful Planned Parenthood Murder, Inc. organization’s profitable little sideline of selling the body parts of murdered babies, while legislators and everybody ELSE turn a blind eye to their BLATANT VIOLATION of laws against doing that. Those undercover videos PROVED they are doing this. LIBTARDS just disregarded that–it was “edited” they say, and not true. BULL PUCKEY. It IS TRUE, and this ENTIRE COUNTRY has the blood of MILLIONS of innocents on its hands that are being SLAUGHTERED so that “non-profit” PP can get even RICHER. It’s not as bad as the butthead in VA admitting what he did about infantcide, when THEY passed their late-term abortion bill..
It’s most likely the same spirits being served who were behind human sacrifice and temple prostitution centuries ago. It has to be fought on that level. If you read the Old Testament, you can see what God did to the Israelites for the sin of adopting the DETESTABLE practices of the Canaanites who worshiped an idol named Molech–whose “religion” included the practice of INFANT SACRIFICE. Molech was a HUGE idol made of metal with a pair of large, outstretched “hands” made of metal. There was a raging fire built under the hands, until the “hands” were glowing red-hot–and the LIVING infant was placed on those hands and allowed to scream and writhe while it was literally COOKED ALIVE. The Israelites paid a HORRIBLE price for joining in with this appalling practice, that included being physically INVADED by maurauding barbarians who raped, plundered and SLAUGHTERED millions of men, women, AND chldren, and carried the survivors off into captivity and slavery. Is what THE Israelites did any more barbaric than the “rights” the pro-abortion crowd are demanding? What price do you suppose WE will pay for allowing these abominations on the scale of MILLIONS of innocents? Those Molech-worshipers were PIKERS compared to the mass-production SLAUGHTER being facilitated by Planned Parenthood and its advocates, which stains the hands of EVERY American with the blood of innocents, since our tax dollars are being used to FUND the slaughter. How many more babies need to die before God does us like He did the Israelites? We’re One Nation Under God. They’re the original Nation Under God. I sincerely hope we can end this unspeakable practice and slay all the priests of Molech/Baal before God decides to pull the plug on America. Because once He passes judgment on us, we’re done. It’s all over then. Surely, God must have something remaining in His plan for us to fulfill. Otherwise, why is He allowing us to remain intact? BTW, the USA isn’t mentioned at all in the Book of Revelation. Sobering thought.